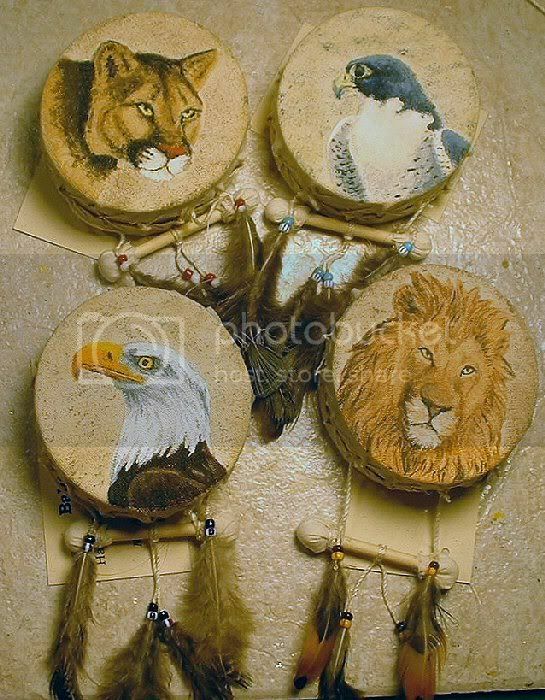 The feathers came from one of those mixed-feather bags at the craft store. I was trying to match them to the colors used on the drums themselves, with mixed results; several of them have iridescent sheens that aren't visible at all angles. But I did what I could with what I had, which is about all I can say for most everything I've ever accomplished (or failed to accomplish) in my life, I suppose. Sorry, but I've run out of commentary on my images. Feel free to make up your own. *sniff* They grow up so darned fast... These are laid out in the same order as the "back shots" above, so you can work out what goes with what on your own. Consider it a mental exercise. So anyway, as of Tuesday these guys will be out of the house and I can focus on family ornaments from now on... unless, of course, they sell, in which case family stuff may be sidetracked while I whip up a second batch of drums. I'm trying to decide which would amuse the Dread Demon Reality more: another mad midnight dash on Xmas Eve to finish off family stuff because I've been too busy making and selling drums, or finding out that nobody wants to buy something I've made, so I've essentially wasted two months of my life planning and creating these guys. I'll find out soon enough, I suppose... for now, onward into Operation Ornament I charge. A quick 'n dirty shot of my progress thus far on Operation Ornament. 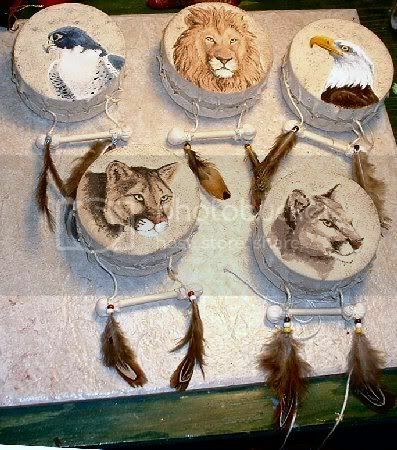 Four of these are intended for resale; the cougar under the eagle is staying with me. (He looks somewhat cooler in person, and I wasn't sure I could replicate the effect anyway.) I'm taking a break while I decide what, if anything, else needs to be done aside from adding a hanger and printing out a quickie tag. (The usual info: Hand-painted item, Not A Toy, Do Not Force Feed To Children Under 3, etc.) Yes, it seems a bit skewed: two raptors and two big kitties. I tried a few others, but they fought me incessantly, so I gave up on them for now. If/when these prove salable, I'll take another swipe at 'em. I have to get these suckers done and off the workbench ASAP because, come Thanksgiving, I'm breaking open the Paperclay and shifting focus to my usual round of family ornaments. Armatures are mostly bent already, and I'm thinking of using drum blanks for a couple anyway, so hopefully I'm not starting too late on those. Temporarily supplanting Operation Machete as my top priority, Operation Ornament concerns my plan to not only finish ornaments for the family before Xmas Eve, but to finish ornaments for potential resale as soon as inhumanly possible. 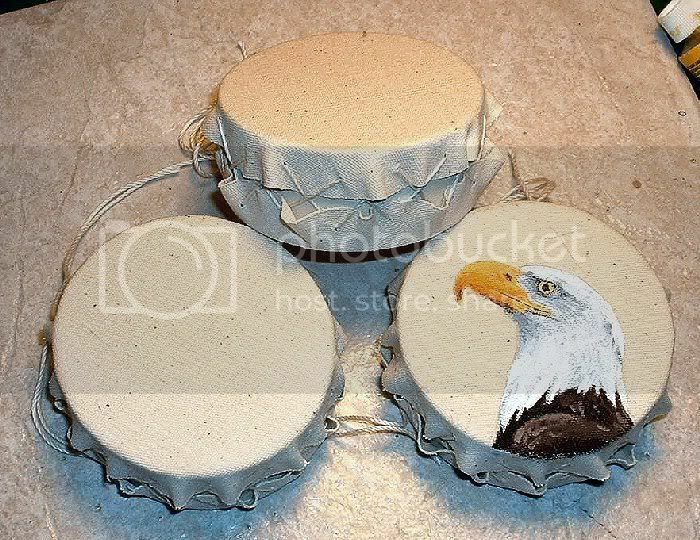 So far, after testing numerous materials and designs, I finally have several double-sided drum blanks made up, as seen in the above photograph. That's canvas (grain not quite so obvious in Real Life), primed with textile medium, and bound with crochet thread over (painted) rounds cut from a 3" diameter shipping tube. No, it's not drum-tight, but it's not exactly loose, and I got more tension than I expected; cylinders are surprisingly sturdy, especially compared to one's fingers when one is pulling on crochet thread. Ouchie... but it's not a proper project if you aren't willing to bleed a bit, I suppose. Anyway, the test-image eagle is from a photo I snapped at a raptor demo during Salmon Days (a local fish-themed fall tourist magnet.) I'll be doing a bit of embellishment after painting, of course - I'll be adding a hanger, and probably some beads or a simple little cut-dowel drumstick and cheapy feathers. 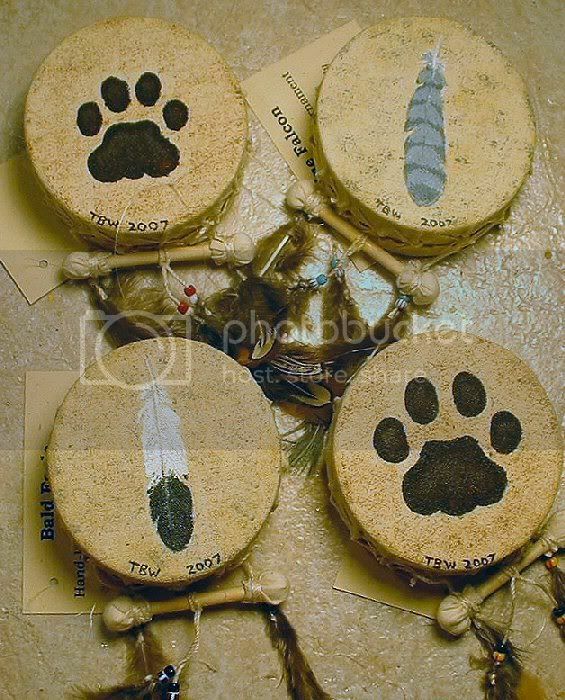 But my priority is getting the drum itself painted up; current plan calls for an animal image on one side and a matching footprint/feather/something on the other. I painted the eagle on a sacrificial blank to see how it would work, having never painted on canvas before. 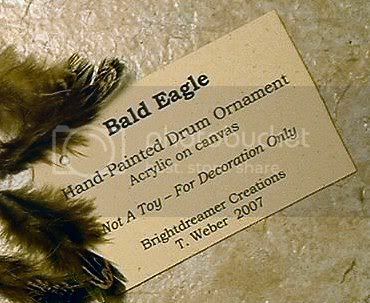 Nice eagle, huh? Get a load of that eagle. I hope people like eagles, because at the moment it seems to be the only thing I can paint with anything resembling competency or consistency. At least time's being a little less evil to me. I'm back to chapter 14 or so in the story - I was rereading some earlier stuff and determined that that's about when I lost the energy that, to me at least, was making the thing work - but I actually like what I've written aside from that and feel compelled to keep on going, which is good. (Still don't even have a working title, which probably isn't good, but I want to know how it ends before I label it.) I also, by virtue of ducking out of work an hour early (we were finished with work proper, but there was a surprise baby shower for a coworker I barely know the name of which most everyone was going to hang around for) and running off to Half Price Books, snagged a book I've been hunting for for well over a decade (The Flight of Dragons by Peter Dickinson - under 8 bucks, too.) Hey, time's even giving an extra hour to play with this weekend. I suppose I ought to take advantage of the time I've been given to get my lazy tail off the computer and back to work. Operation Machete can't go forward until Operation Ornament is complete (or reasonably close to completion), and Operations Budget, Clutter Cleanup, and Finish A Frellin' Story are waiting in the wings.